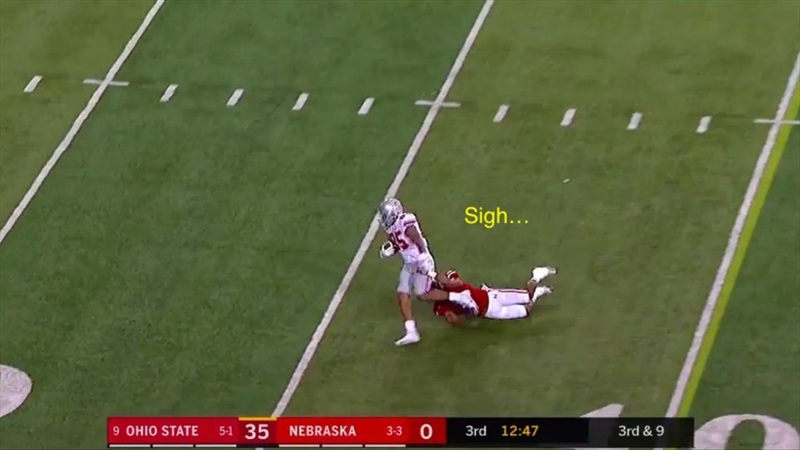 I could pick at any number of a things to break down from Nebraska's 56-14 home loss to Ohio State on Saturday, but one of the most eye-popping stats from that game was the Buckeyes going 10-of-13 on third down conversion attempts (and then converting on fourth down on two of the three times they failed to convert on third). Nebraska is now 116th in the country in third down defense, allowing opponents to convert at a 46.6 percent clip, which shows that this wasn't simply a one-game issue. 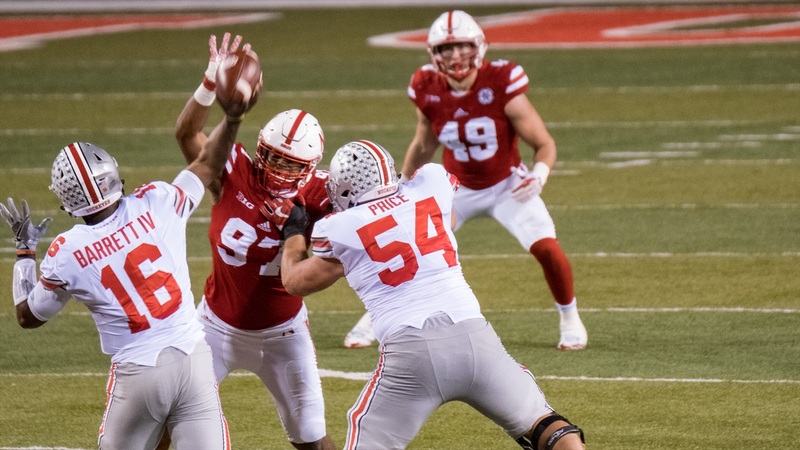 Ohio State scored a touchdown on each of its first eight drives against the Huskers. 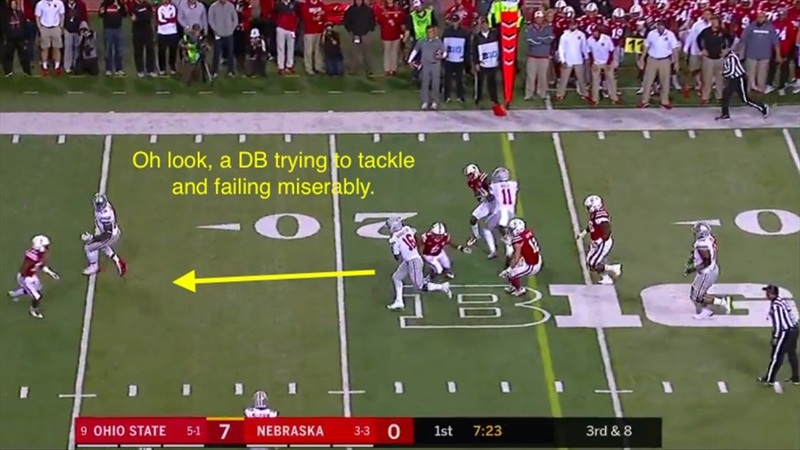 Nebraska had multiple chances to get off the field and could not capitalize. What was the problem? Let's dive into the tape to find out. 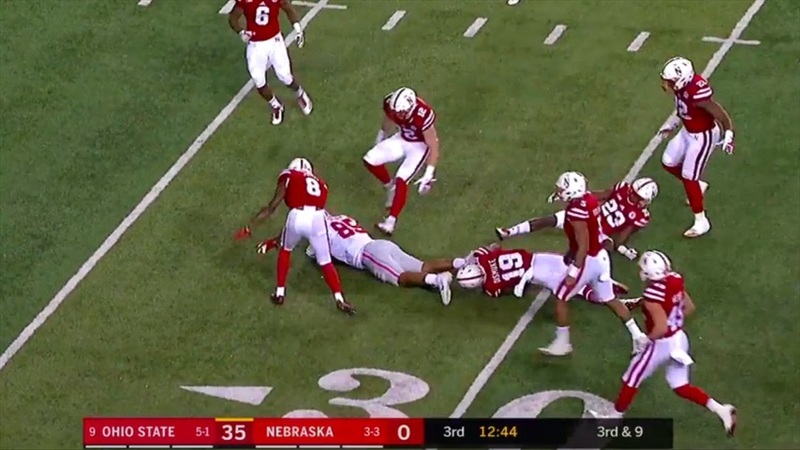 Nebraska's first third down came on its third defensive snap of the game as an incomplete pass on second down set up a third-and-2. 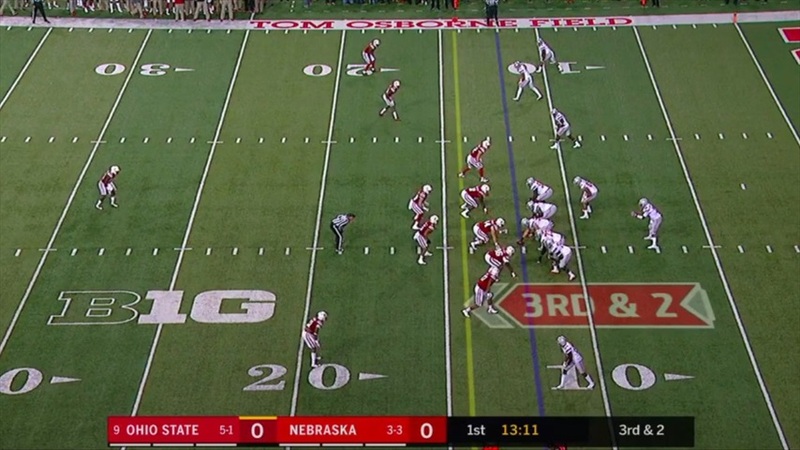 Nebraska lines up in base with the entire front seven within 4 yards of the line of scrimmage. The boundary end, Carlos Davis, takes the C-gap, or outside the tackle. Sedrick King, the boundary outside linebacker, plays directly behind him rather than filling a gap for some reason. 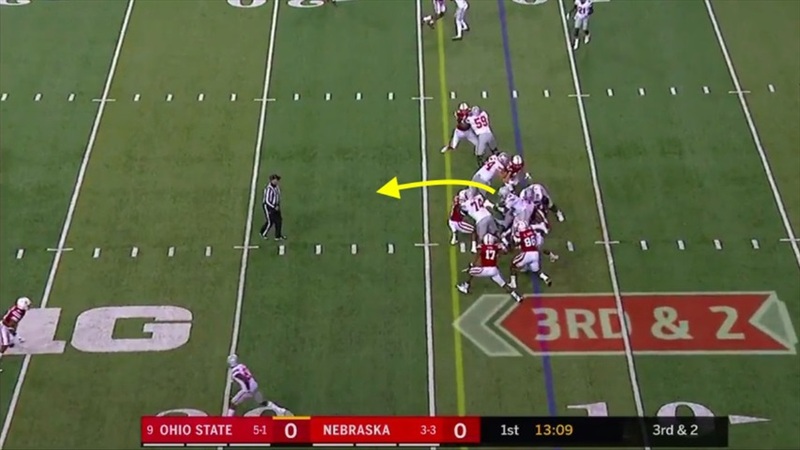 The left tackle takes on Dedrick Young at the second level, leaving the tight end coming across to clear the way for quarterback JT Barrett. Barrett runs through the hole and then cuts back through the B-gap to the right of the tackle and Young, away from King. 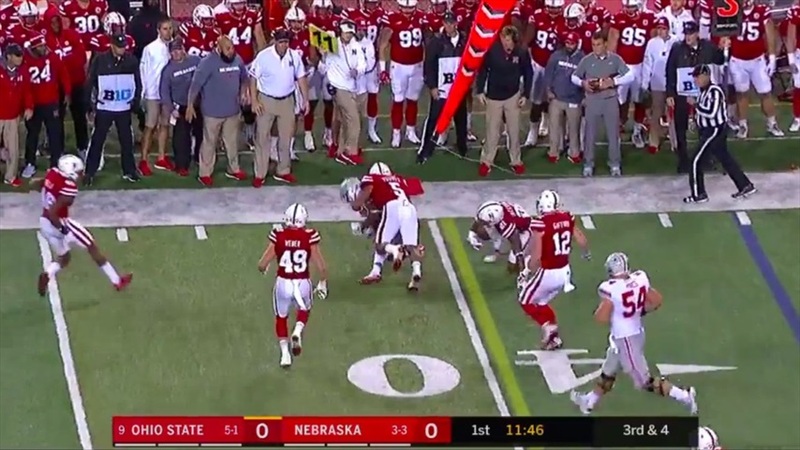 Young manages to get a hand on Barrett as he crosses the line to gain, but Barrett drags him and his blocker another 4 yards before going down. 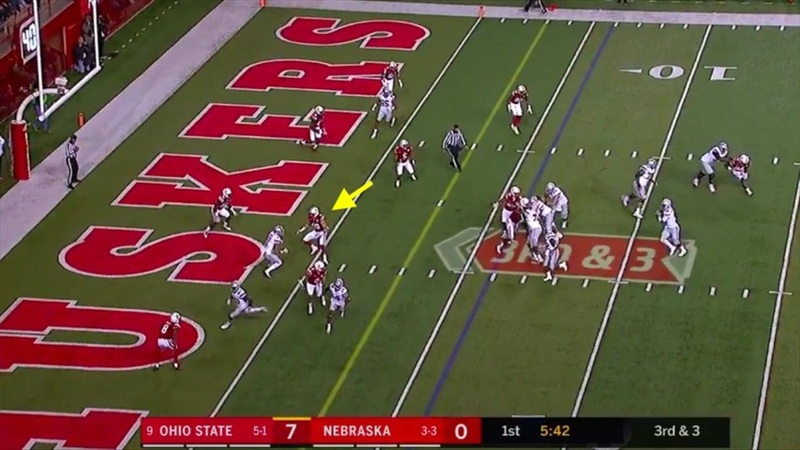 Nebraska had an unblocked player in King, but his positioning virtually eliminated him from the play and allowed the Buckeyes to move the chains fairly easily. Multiple players filling the same gap has been a recurring issue this season. Three plays later, Ohio State faced a third-and-4. 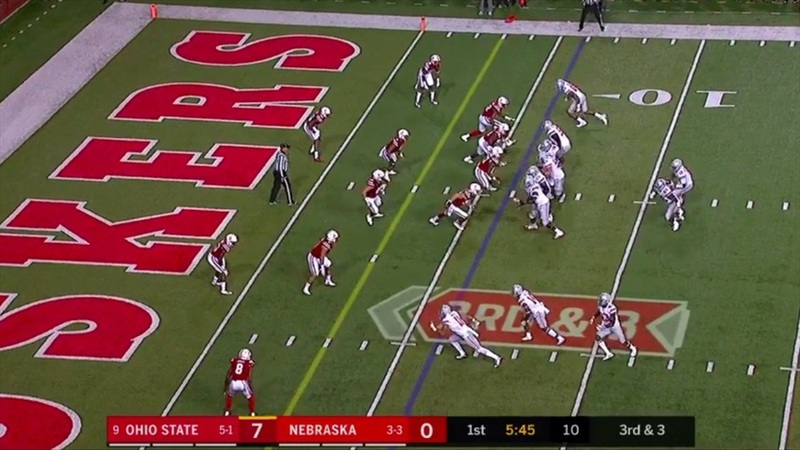 Barrett lines up with two receivers to either side of him and the outside receiver to the right motions in behind the inside receiver just before the snap. The inside linebackers, Young and Chris Weber, both drop into coverage. Young and Weber both drop about 6 or 7 yards when the offense only needs 4. The receiver who motioned starts an inside route over the middle, plants his foot and cuts back outside. Barrett hits the open receiver, KJ Hill, a yard shy of the line to gain. However, the linebackers are too deep to do anything to prevent the first down. Young makes the tackle, but not until after Hill picks up the first down. 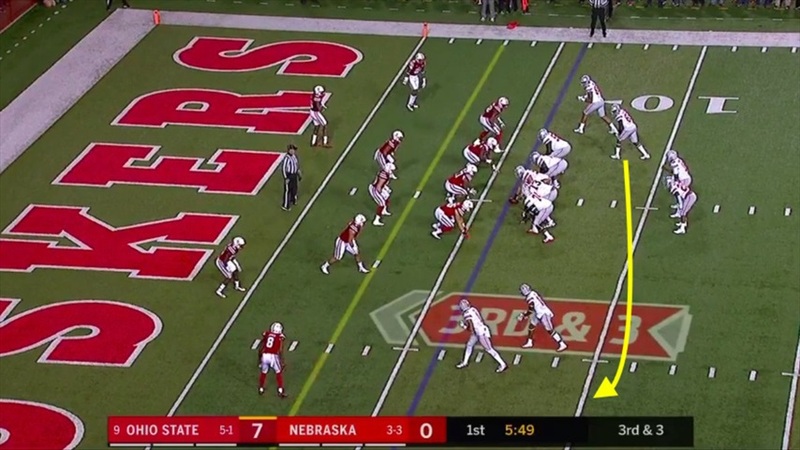 Ohio State got a favorable match-up with a linebacker on a receiver and made Nebraska pay for it. Nebraska's conservative scheme didn't help matters any. Two plays later, Ohio State ripped off a 52-yard touchdown run. The previous two plays were third and short, but this time Nebraska is in good shape with the Buckeyes needing to convert on third and 8. 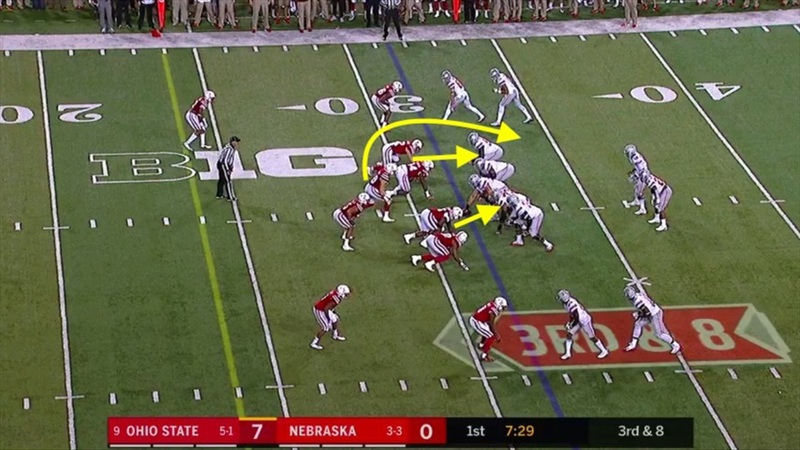 Nebraska lines up with a four-man front with the line split to the edges. Weber shows blitz up the middle, but then loops around and rushes from the left side. The running back runs into the left flat and Young follows him, vacating the middle of the field. Weber nearly reaches Barrett, but the tackle gets just enough of him to use the linebacker's momentum to send him flying past Barrett as the quarterback steps up in the pocket then takes off. 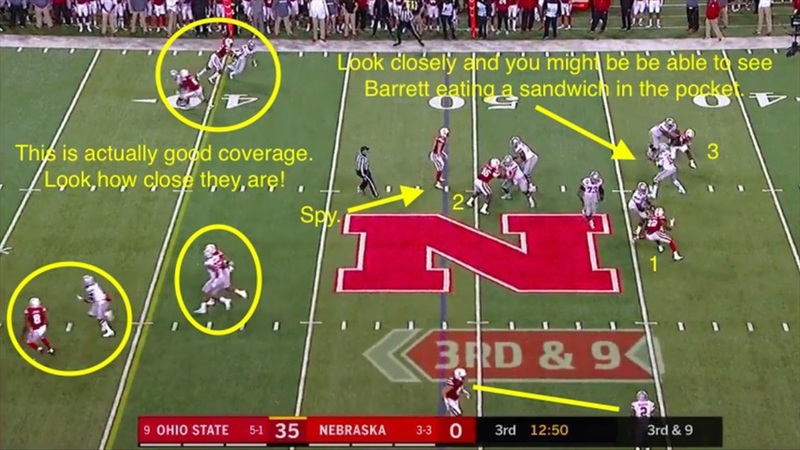 Barrett has plenty of space in front of him because of Nebraska's man coverage and the lack of a spy. It doesn't go well. Barrett easily side-steps him as Lee over-runs the play and the speedy quarterback continues on his way. Dicaprio Bootle finally catches Barrett and gets him to the ground, but not before an 18-yard gain and a first down. With a dangerous dual-threat quarterback like Barrett behind center, discipline and scheme are incredibly important. None of the pass rushers win their match-up and there was not a spy on Barrett, leaving no one in the middle of the field to account for him. Barrett's not done using his legs, though. 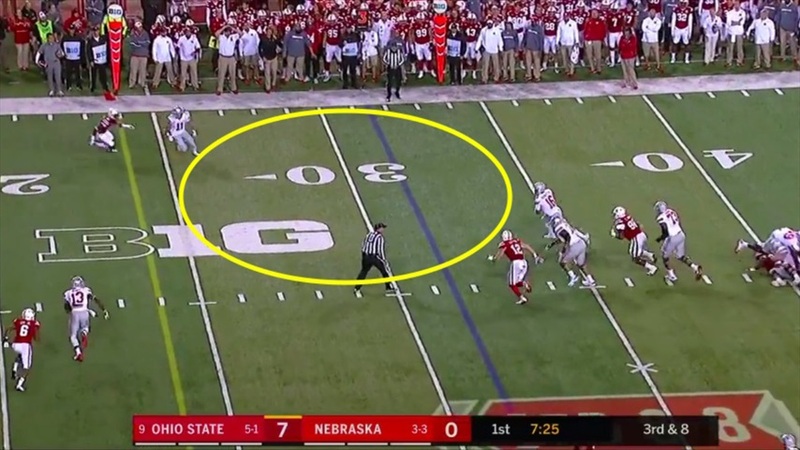 Two plays later, Ohio State had a third-and-3 from the 6-yard line. The Buckeyes line up with two receivers to either side, but Barrett motions one from the right to the left side. Meanwhile, Nebraska doesn't react at all. Not one Husker adjusts to the motion. 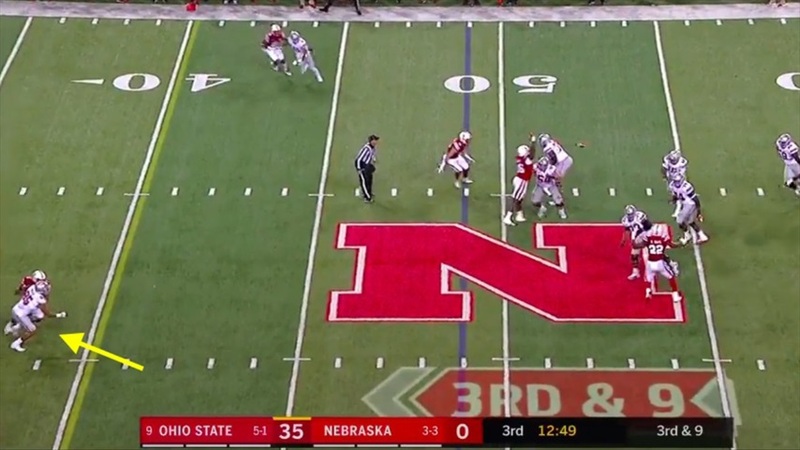 Ohio State now has three receivers to the left, while Nebraska has a corner, a safety and a linebacker over on that side. Chris Jones takes the receiver running a corner route while Marcus Newby takes the underneath receiver. 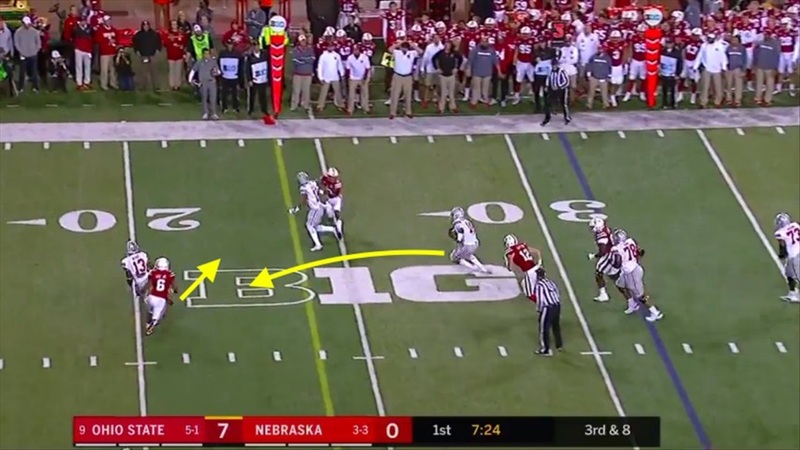 Instead of Bootle coming forward, however, Weber turns his head and covers the third receiver as Barrett starts to roll out to the left with his eyes downfield. So let's review: three receivers, three guys covering them. That's good, right? Well, not necessarily. 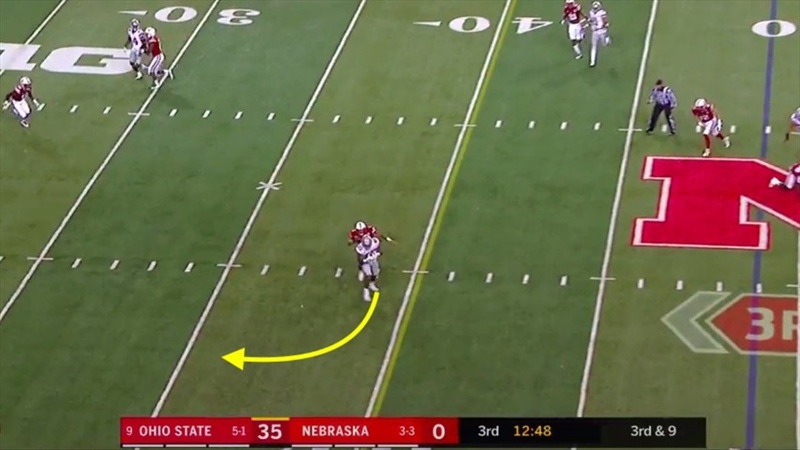 Barrett reads the coverage and pulls the ball down, becoming a runner. The safety is still standing in the end zone covering nobody. Nose tackle Deontre Thomas sees Barrett leaving the pocket and tries to chase him. Barrett takes off and Thomas lunges at him in desperation, but the freshman can't quite catch him. Weber can't get past the receiver either. Barrett jogs into the end zone untouched for score number two. This play shows a combination of a couple of issues that popped up on the first two plays. First, either the scheme, bad communication or a bad read (or all of the above) results in two players (Weber and Bootle) essentially trying to cover the same area, ultimately making Bootle redundant (like King in the first play). 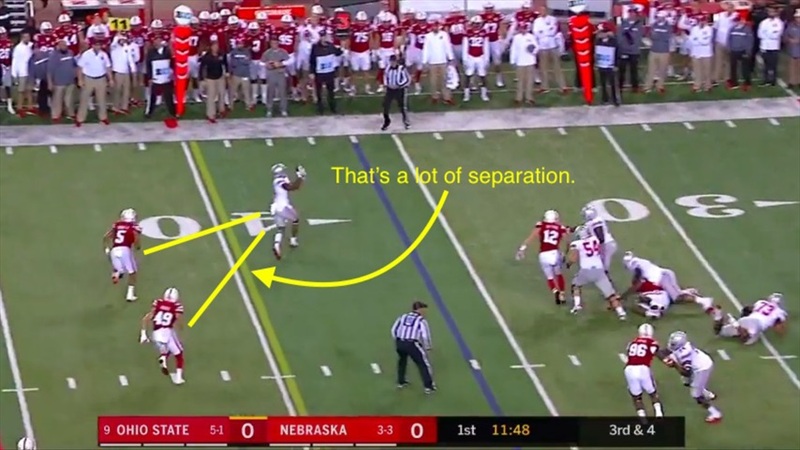 This also leaves Nebraska without any kind of spy for Barrett like on the second play. Ohio State only faced two third downs in the second quarter and both were third and 1, so let's skip ahead to the third quarter. Ohio State was marching down the field when a 1-yard run on first down and an incomplete pass on second set up third and 9. Before the snap, Barrett motions to an empty backfield and Weber chases the back to the perimeter, showing man coverage. 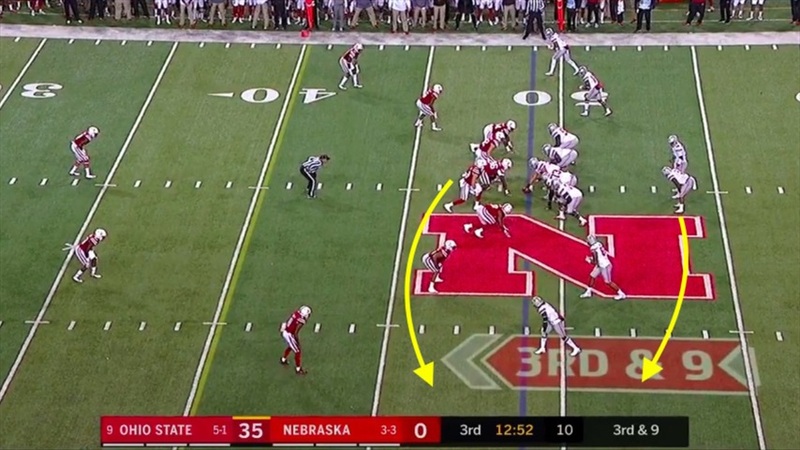 Nebraska learned from getting burned previously by leaving a player in the middle to spy Barrett, Luke Gifford. 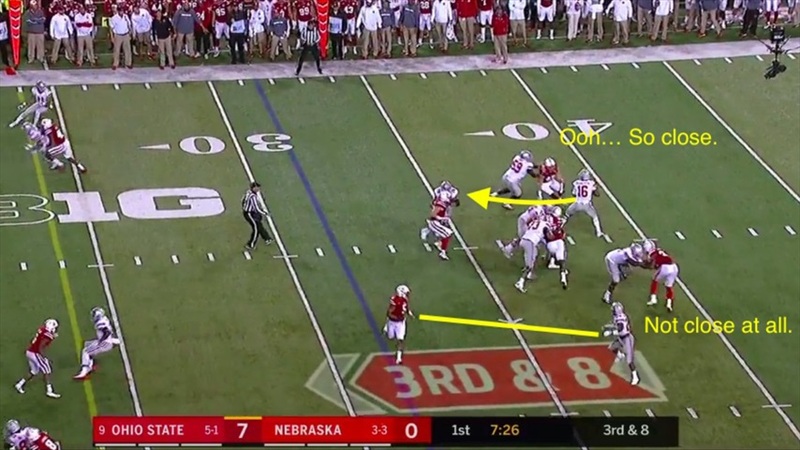 This time they even play tight man coverage, and Nebraska picks up every receiver. 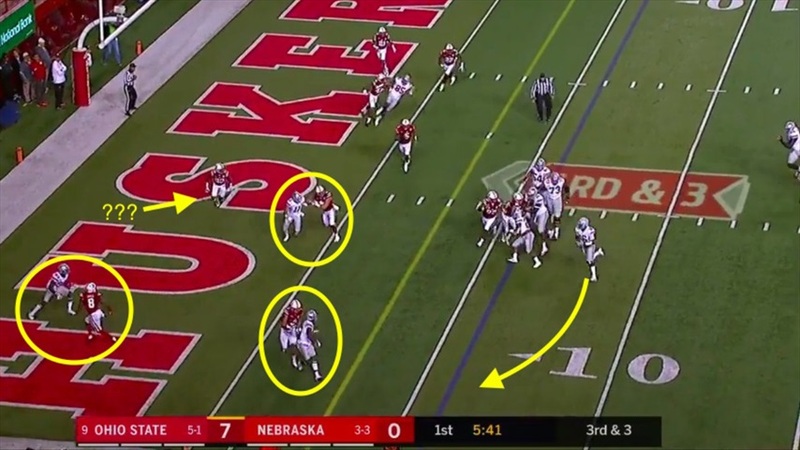 However, leaving Gifford as a spy means Nebraska has just three players getting after the quarterback. 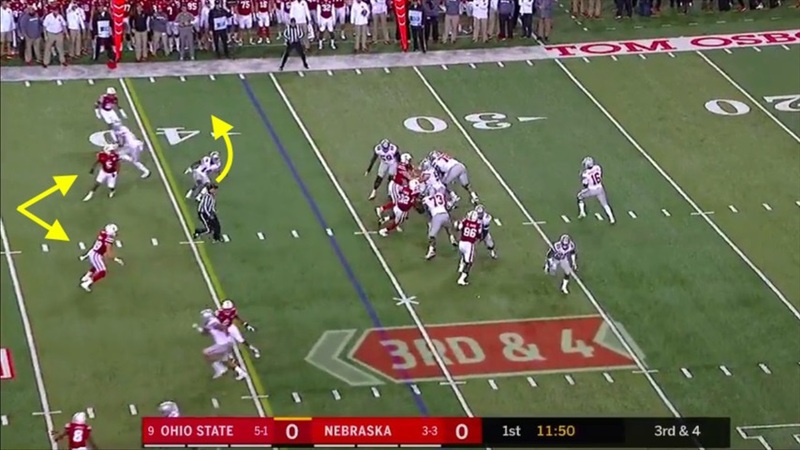 The coverage is still pretty tight, but Barrett never feels any pressure and stands in the pocket to deliver the throw. Young is right on tight end Marcus Baugh's hip, but Barrett essentially makes a back-shoulder throw. It's a beautiful throw into a tight window and Baugh hauls it in. The 6-foot-5, 255-pound tight end turns and starts to make his way up the field with Young right on his heels. Young makes another diving tackle attempt and slides right off of him. 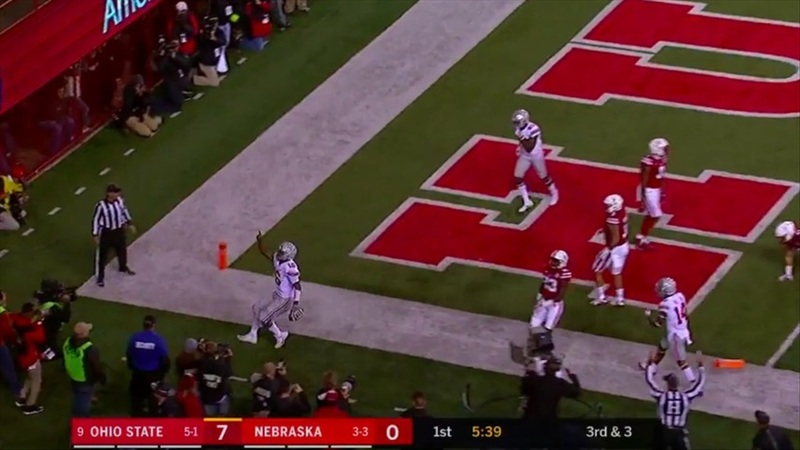 Baugh picks up another 8 or 9 yards before the Huskers rally to the ball and get him to the ground. Three plays later, Barrett threw a touchdown pass to put Ohio State up 42-0. 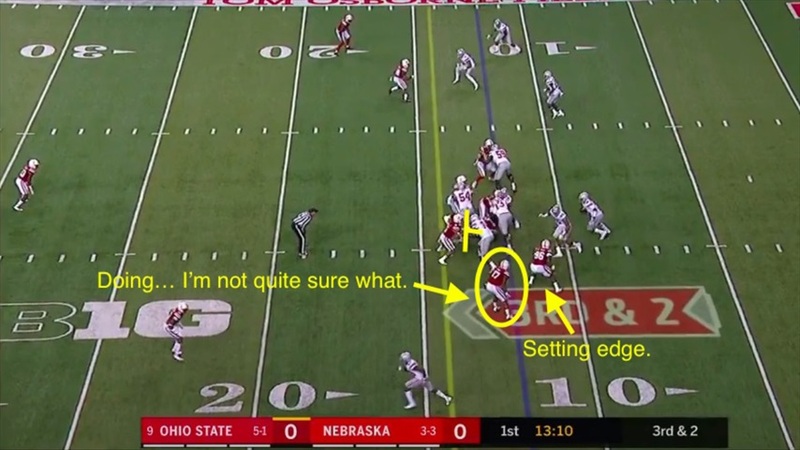 Ohio State's ability to move the ball in many different ways puts a lot of stress on a defense, but Nebraska has struggled to get off the field on third downs against a variety of different offenses this season. 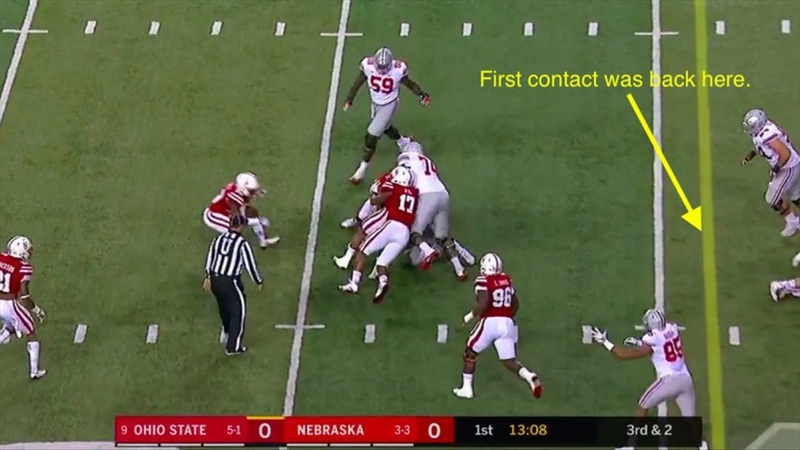 Barrett's ability to move the ball through the air and on the ground makes him a nightmare match-up, especially when compounded by the fact that Nebraska struggled to get any kind of pressure (one sack, one pressure). Add in questionable scheme choices, communication breakdowns and an athletic disadvantage and you have a recipe for an offense doing whatever it wants, which is exactly what we saw on Saturday. 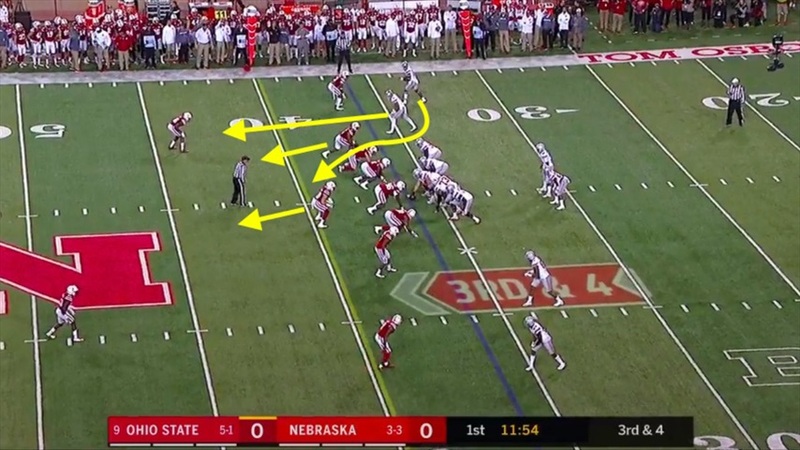 Bob Diaco has a lot of problems to fix with this defense, and its performance on third down should probably be first on the list.